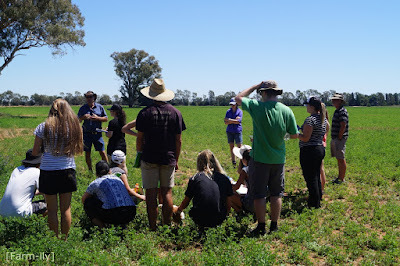 Great to have students on farm wanting to learn. New blood upon the scene and it's good that happens. How wonderful. For them, and for all our futures. That's quite encouraging to see kids that are interested in farming! Ditto what Karen L R said. My granddaughter is a huge AG fan and is studying for a poultry science, with the hopes of being an AG teacher. It's not farming the land, but it's still a wonderful field to study. I always like to see kids become interested in farming and ranching. I just think there is something about kids and farms that go together. Even if they don't love it, I think it is good for them to experience it. Yes I totally agree. These students are in Year 12, their last year of high school, studying Agriculture or Environmental Science at a high school on the east coast of Australia, some 650kms away. It was a privilege to be able to show them around our area. It's definitely a good sign! Male and female - fantastic. Yes it's always good when you have students willing to listen and learn.